Mens sapphire rings solve an age-old problem - what to buy for the special men in your life. Sapphire stones are a symbol of truth, royalty and enduring devotion. Top qualities you would expect from your man! Men always seem to have everything you can imagine. They are the hardest people in the world to buy for. Tasteful, masculine, thoughful jewelry selections such as mens sapphire rings can solve this problem quite nicely. Men wearing rings is not a new concept. Whether you are shopping for blue sapphire rings for men, men's wedding rings or or contemporary engagement ring for your man, you will only be following a long line of royal tradition. Men have been wearing rings for as far back as any recorded documents ever found. During ancient times, wedding rings and practical purpose rings were a sign of wealth and power. Peasants couldn't afford such luxuries. Guess what? both Princess Diana and now Kate Middleton - the Duchess of Cambridge, in even the most recent times, got "stunning ring befitting of a royal engagement" in the form of a 12 carat sapphire ring during their respective engagements. Times haven't really changed that much. Even though the average person can now afford a simple wedding band, jewelry, especially rings, are still one of the most recognizable signs of wealth and power. These days, about the only practical purpose a ring serves is to show your status. A promise ring – yes, men can wear promise rings – shows that you are in a steady relationship that shows promise of going farther. An engagement rings tells the world you have agreed to be married. You have accepted a proposal and are betrothed to marry your intended. A wedding ring shows the world you are taken. You are committed to one person for the rest of your life. Practical rings in ancient times had many other purposes. The Royal seal. This was probably the most respected type of ring. When a document or letter was sealed in wax and marked with the Royal seal, it garnered respect and authority. Only the king or queen of the country could use the Royal seal, indicating the whatever bore the seal was an official issue of the sovereign. Falsifying the seal usually meant death because it was viewed as an act of treason. Noblemen also had seal rings. This was not treason because their rings were not forgeries of Royal rings. They merely let the receiver know that the letter or document was official correspondence from the lord or lady of the house of that particular seal. Forging these seals was also a very serious crime. Protection. Less glamorous rings were worn by bowmen. The rings protected their fingers when shooting arrows. Identifiers. Physicians wore rings to identify themselves as physicians. Although rings still have some purpose today, most are worn merely for adornment and given as tokens of love or appreciation. 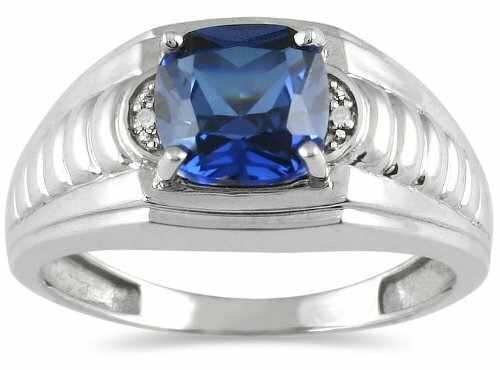 Mens sapphire rings are the perfect choice for this. They come in blue, yellow, pink and white shades, with the blue ones being more popular. The choice is yours to make. Traditionally, teens have often exchanged class rings as tokens of friendship or to signify a relationship. These days, men and women are exchanging promise rings and/or engagement rings. Mens sapphire rings are becoming the ring of choice. 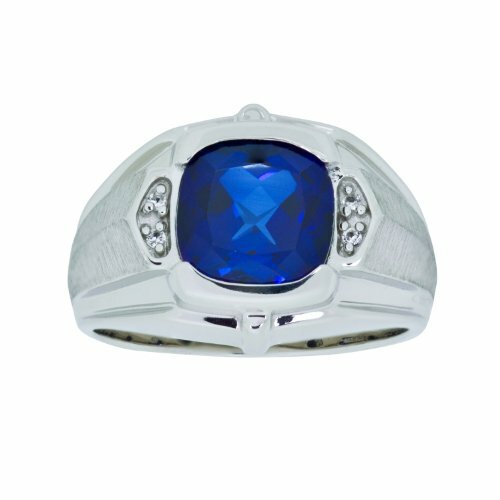 The stunning deep blue mens sapphire ring has become a favorite amongst givers and receivers. The gems can be cut into any shape or size, to compliment any type of finger. Men with thicker fingers tend to prefer the chunky cut, while more slender fingers look better with a smaller gem. The star sapphire ring makes a fabulous fashion statement on all types of fingers. 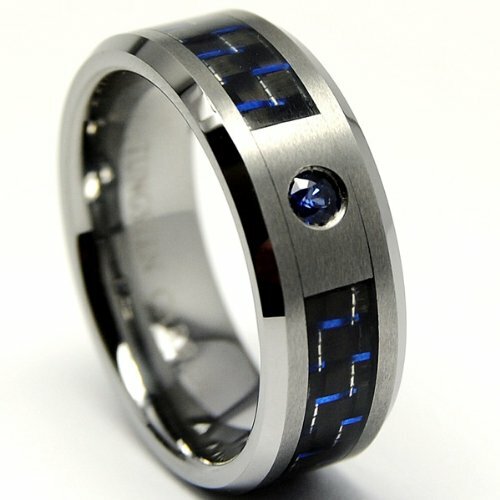 Match the cool blue of the sapphire with a tungsten metal band and you really have a man's ring. Sapphires can be mounted on any metal, the same as any other gemstone. Tungsten just adds a little bit more masculinity. Tungsten is the new sterling silver. Formerly if a gem was not mounted on sterling silver or gold, it was viewed as less desirable. 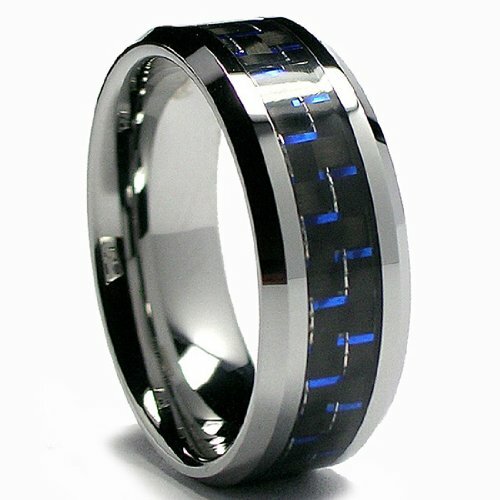 Today, tungsten is all the rage, especially in jewelry for men. Men love tungsten. It is a durable metal that can be polished to perfection. And with a name like tungsten carbide – it just oozes masculinity. The best part, it won't ding or dent. Of course, you never want to wear a ring while working on a motor or heavy machinery because it could catch and rip your finger off. But, with a tungsten carbide band housing a beautiful sapphire gem, you could, without worrying about damaging the ring. Sapphire and tungsten make a great pair because both are known for their durability and strength. Not to mention unmatched beauty. That is not to say that all men love the color blue. But, if blue is your color, mens sapphire rings mounted on long lasting and great looking tungsten will definitely be on your wish list. As mentioned above, sapphire comes in blue, yellow, pink and white colours. The blue ones are the most popular and more expensive. Even amongst the blue sapphire, not all blue shades command the same quality or cost. The very light blue and deep blue stones are less expensive. 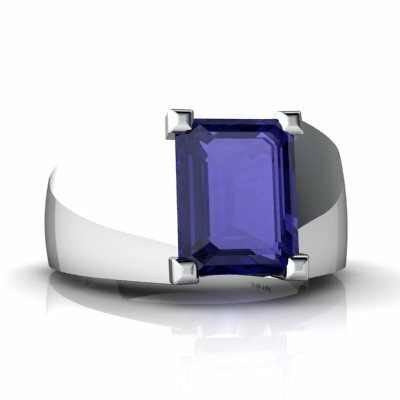 The middle range - fabled cornflower blue from Kashmir, or exceptional blue sapphire rings for men are the top of the range in quality and most expensive - even more expensive than diamonds. Gentle pink and lively yellow mens sapphire rings are also of very top quality. Be guided by the colour of stone you like, and not the cheapest, as you could be paying less for more and vice-visa. When buying your mens sapphire rings, or indeed any sapphire ring, look out carefully for fractures or impurities in the stone. Get under a light and magnifying glass if necessary and take a look at what you are paying for. If you are buying online, be sure that you can return it if you are less imressed by teh quality or if you find any blemish. Are you in the market for a men's sapphire engagement or wedding ring? Do you have great experience with buying this number one coloured gem stone of all times? Or do you have a query or indeed any thoughts to share on this topic? We always love to hear from our readers as well as get their contributions on issues discussed here at ngoziedema.com. Share your thoughts here! Your story will appear on a Web page exactly the way you enter it here. You can wrap a word in square brackets to make it appear bold. 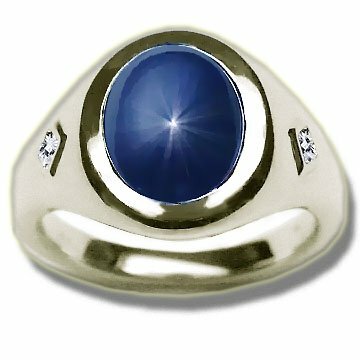 For example [My Story On Men's Sapphire Rings ] would show as My Story On Men's Sapphire Rings on the Web page containing your story.